This photo includes (I think!) 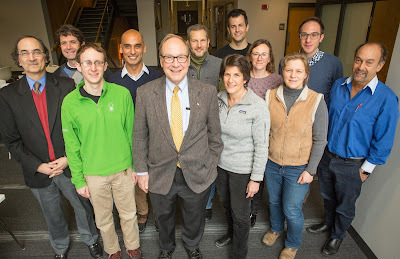 all current members of the Harvard faculty whom I have taught. Thanks to everyone for making the effort to show up, and thanks to Eliza Grinnell for her typically masterful staging and camerawork! Two questions. Am I missing anyone? And can anyone think of another Harvard professor who has had eleven of his or her students on the faculty simultaneously? Everyone in the photo has a faculty appointment and took a course from me. Mitzenmacher, Vadhan, Malan, Seltzer, Nesson, Rush, and Leitner were also my TFs.